A garden hose all by itself is only moderately useful. You can hold your thumb over the end to spray the water, but that gets tiring quickly. Left in the sun, the rubber quickly degrades and they are easily kinked when you try to roll and unroll them. Fortunately, there a numerous accessories that have been invented to make hoses much more user friendly. If you need to spray off the deck, wash the car or fill the kiddie pool, there is a nozzle out there for you. Actually, most "pistol-style" nozzles come with all these capabilities in one. You simply turn the dial on the nozzle to change the spray pattern from a fine mist to a sharp spray and other variations in between. 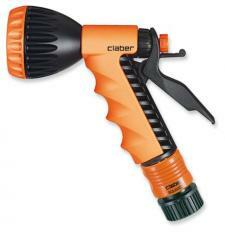 Claber makes an ergonomic molded plastic nozzle with nine different spray patterns that is able to withstand water temperatures up to 160 degrees for those hot days when the hose has been lying in the sun. Rakuten offers it for around $20. Spray nozzles are known for how easily they break, but the Bel Air "Ultimate" nozzle on sale at Kotula's for $20 is made to withstand any abuse you give it. Rather than a pistol, it has a funnel shape with just one moving part. Twist the spray head right and left to modulate the spray from a heavy stream to a light sprinkle. Pistol-style high pressure nozzles are good for cleaning outdoor objects, but are not the right accessory for watering plants. A watering wand that gives a gentle shower, mimicking natural rainfall, is a better bet. Most models have an on/off lever incorporated into the wand, but you can always add one between the end of the hose and the wand for the sake of convenience. Dramm makes a durable, top quality wand that retails for around $50 at Garden Tool Co. It receives rave reviews from customers and is noted for the high output, which cuts down on watering time. For about $40 you can pick up a Gardena watering wand at Lowes that has soft shower, hard spray and gentle mist settings all in one. Gardena has an excellent reputation among gardeners, though their products require the additional purchase of a special hose fitting that allows them to snap on and off rather than constantly threading and unthreading each time you want to attach a different accessory to the hose. Hose reels make it easy to coil up your hose kink-free when it is not in use. Most are designed to be mounted on a wall, though some models rest on the ground. Typically, a short hose connects to the water supply and then the garden hose is screwed to a hose connector on the reel. A hand crank helps facilitate the process of getting a long, heavy hose coiled up neatly. Reelcraft makes finely crafted, long-lasting hose reels. Their powder coated steel reels have permanently lubricated joints and are intended to last a lifetime. Hayneedle offers Reelcraft models designed for 50- and 100-foot hoses for $98 and $115, respectively. 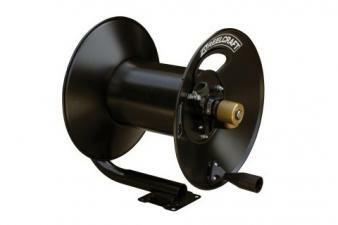 The Suncast Hideaway Hose Reel from Midland Hardware rests on the ground and accommodates up to 165 feet of hose. It is priced economically at just under $40 and is an attractive choice because the hose is stored out of sight inside the taupe square plastic box. A hose caddy is essentially a portable hose reel. This is helpful when you want to use the same caddy at multiple outdoor faucets. Hose caddies have either a metal or plastic frame, a handle for pushing or pulling it and all-terrain wheels that allow it to roll it through the garden with ease. Some models also include a small shelf or storage compartments for hose nozzles, small tools or anything else you might want to have handy as you work in the garden. The heavy duty Suncast Steel-Core Hose Reel Cart from Wayfair holds up to 300 feet of hose and includes a 'slide-trak' feature that guides the hose onto the reel, distributing it evenly to prevent tangling. Customers mention the great length of hose it can hold and the quality; it retails for just under $100. Sears offer an economical caddy called the Hosemobile from Suncraft for just $30 that reviewers call "just what I needed" and "durable". It is made of plastic and can hold up to 175 feet of hose. If you're stringing multiple hoses together, you may want to install a shut-off valve between each one, in case you want to disconnect them while the hose is pressurized. The cheap plastic ones are tempting, but they crack in a heartbeat. Instead, consider investing in a brass valve, like those sold online at The Garden Store for about $6. 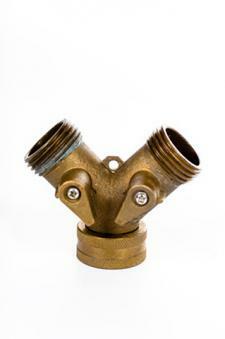 They also sell brass splitter valves which allow two hoses to be attached to one source. At the spigot where the hose is attached, a simple timer will ensure that you don't accidentally leave the hose running all night. Ace hardware sells one from Dramm that resembles an old-fashioned kitchen timer for under $20. It does not require any batteries and can be set for up to two hours of automatic watering. It's inevitable that garden hoses wear out at some point, but it's easy to repair leaks and extend the life of the hose, rather than sending it to the landfill. Plumberstock sells a complete garden hose repair kit for only $5 online, including hose washers, male and female hose ends and a fitting to splice your hose back together if it springs a leak in the middle. The key to extending the life of your hose is to protect it from the elements whenever you aren't using it. Sunlight and freezing/thawing fluctuations are its worst enemy. If the most convenient place to connect the hose to a spigot happens to be in full sun, a completely enclosed hose reel or caddy is the best storage location during the garden season. 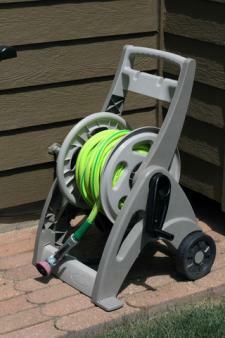 If you have a well-shaded place to keep the hose outdoors, however, a simple wall-mounted hose reel is sufficient. Whenever you coil up the hose, try to prevent any kinks, as these will lead to cracks over time and the hose will need to be repaired. One technique to prevent kinks is to use the shut-off valve on the nozzle to trap the water inside and then coil it while it is under pressure. Hoses aren't needed in the garden in the wintertime, so its best to store them for the season as soon as the first freezing weather arrives. Open both ends of the hose and unwind the full length, stretching it out on the downhill side. Let the water drain and then coil it back up hill, so every last bit of water drains out the open end. 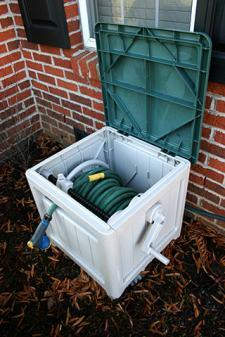 Store the empty hose in a basement or garden shed for the winter where it will be protected from freezing temperatures. Keep it in a box or caddy, or you can purchase a storage hook for hanging like the Organized Living Storage Loop Hook that is under $25 from Overstock. Leaking, tangled hoses can be the bane of a gardeners existence. However, the right accessories and a little TLC can make using hoses much more enjoyable and preserve your investment by extending their useful life. Which Berries Grow on Trees?